Set thirty years after the events of Ridley Scott’s original science fiction masterpiece, Blade Runner 2049 is driven by Officer K (Ryan Gosling), a new-model LAPD replicant tasked with tracking down and “retiring” older models of his own kind. In the years after 2019, it seems, the original replicants rebelled, causing the Tyrell Corporation to go bankrupt. It was purchased by the Wallace Corporation, whose founder, Niander Wallace (Jared Leto), saved the world from famine when Earth’s biosphere collapsed. Wallace redesigned Tyrell’s replicants to make them more compliant and has used them to colonize nine planets Off-World. In order to take humanity farther, however, Wallace needs a way to manufacture his replicants much faster – he needs them to reproduce naturally. So when one of Officer K’s investigations uncovers the remains of an early-model female replicant who appears to have given birth before she died, Wallace will stop at nothing to obtain this secret. But K uncovers a deeper mystery too. If he can solve it, it might be the key to unlocking his own memories – memories he’s long believed to be implanted, but which might actually be real. Villeneuve’s sequel is a bit overlong, but its strengths more than make up for it. Gosling delivers one of his most nuanced and restrained performances yet, and Leto’s quirky method approach is perfectly matched to his character here. The supporting cast shines too, including Robin Wright, Sylvia Heoks, Mackenzie Davis, Dave Bautista, and Ana de Armas as K’s holographic companion, who becomes one of the film’s most interesting characters. I’ll say nothing of Ford, the joys of whose performance you should simply discover on your own. All of this is matched by a magnificent production design effort that expands upon the world of Los Angeles 2019 (and that includes the returning talent of original film designer Syd Mead) and a score by composers Hans Zimmer and Benjamin Wallfisch that functions as the film’s own sonic “ghost in the machine,” laying in heavy but hopeful synthetic textures while also honoring Vangelis’ original compositions. In short, Villeneuve’s Blade Runner 2049 is a minor cinematic miracle. As confirmed by Roger Deakins, Blade Runner 2049 was shot digitally in the ARRIRAW codec at 3.4K (Open Gate) resolution using ARRI Alexa XT and Mini cameras, with Zeiss Master Prime lenses. Also per Deakins, the post-production workflow was done at 3.4K. Visual effects were rendered in 3.4K (some at 4K). The film’s Digital Intermediate and color timing were finished at 4K. For its 3D presentation (both in theaters and here on Blu-ray 3D), the film was post-converted by Stereo D. Though this process was supervised by Deakins, he’s gone on the record as saying that he prefers the 2D experience (on his own website, see this link). In any case, that 3D presentation is offered here on Blu-ray 3D at the 2.40:1 theatrical aspect ratio. Given this film’s dense atmospherics, the 3D effect is better than I expected. There’s good depth – with strong use of foreground, mid, and background elements – particularly in scenes that are both bright and clear, or dark and clear, or bright with dense atmospherics. The latter is especially obvious as K exits his spinner and begins to investigate Sapper Morton’s protein farm. He emerges from a dense fog almost as a dark silhouette, but there’s great separation as the fog begins to clear away. Even in Morton’s darkly-lit home, the separation remains strong. Unfortunately, when the image gets both dark and dense (with snow, rain, and cloud), the 3D can be more problematic, occasionally struggling to maintain a good sensation of depth. This is apparent as K flies back to Los Angeles in the heavy gloom of a rainstorm. His spinner soars over a sea of rooftops in a series of perspective shots that should be dramatic, but the manmade landscape below tends to flatten out until the LA skyscrapers begin to appear. Still, when the 3D effect is good, it’s quite good (and even striking), as in the interior of Wallace’s sanctum and throughout the entire Las Vegas sequence. Coloring and contrast remain solid, though if you compare the 3D image to the HDR presentation on 4K Ultra HD, one does miss bold enhancement of the film’s ubiquitous holographic imagery. All in all, this is a surprisingly good, though not great 3D presentation, but it should please stereoscopic fans. Audio on this 3D disc is 5.1 DTS-HD Master Audio only, for reasons I’ll guess at in a moment. Compared to the Dolby Atmos on the 4K and regular Blu-ray discs the soundstage is smaller and more contained, with somewhat tighter panning and surround play. Clarity remains excellent and there’s good low end support. It’s still a fine audio experience, but the Atmos presentation is definitely superior. As to why the 3D only offers DTS-HD, my guess would be that it’s down to disc space. 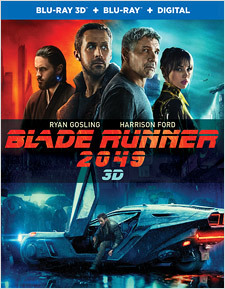 The Blu-ray 3D disc is a BD50, but consider that Blade Runner 2049 is not only a long film, it’s one with almost constantly dense imagery that can make compression challenging. Such films require more file size, which is complicated by the fact that this is 3D, thus requiring 1080p/24 image data for each eye (it’s actually packed into a 1920x2205/24 frame that includes 45 pixels of blank space to separate each image). The upshot of all this is that the image data takes up more space, leaving less room for lossless audio. While the difference between Dolby Atmos and DTS-HD MA file sizes may not be large, mastering technicians tend to favor image quality over audio. So DTS-HD is what you get. The Prologues are quite good, particularly the animated piece directed by Shinichirō Watanabe (of Cowboy Bebop fame), though the live action pieces by Ridley Scott’s son Luke are interesting too. But while the two main documentary featurettes are solid, they’re not nearly comprehensive enough for those fans who will certainly want a much deeper dive into this production. The rest of this material is of the EPK promotional variety. Sadly, there are no trailers for the film, nor are there any galleries of production artwork, or anything at all to do with the film’s score. All told, these extras are disappointing. Note that the BD disc opens with a promo for the Blade Runner: Revelations Daydream VR experience and there’s a Movies Anywhere Digital Copy code for the film included in the packaging on a paper insert. Against all odds, Denis Villeneuve has crafted a truly worthy sequel to Ridley Scott’s original Blade Runner. This is not quite a masterpiece, nor can it be called a “perfect” film like the original, but 2049’s conceptual, visual, and character additions to this world are significant and feel completely organic and true to that compelling earlier narrative. Villeneuve’s Blade Runner 2049 is a deeply cinematic experience, a film that dazzles the senses even as it challenges the intellect. The Blu-ray 3D version offers a solid experience for 3D enthusiasts, though my preference would certainly to view the film in 4K Ultra HD (reviewed here), as the UHD A/V quality is superior in every way. At any rate, good luck finding the Blu-ray 3D version: It’s a Best Buy exclusive but it’s currently (as of the date of this review) not available to order on their website and only some of the retailer’s many stores appear to have product on hand.